Below is an article I wrote for Telegraph website about millipedes, hippos and Haller in Kenya. I’m a trustee of Haller – a charity, I co-founded that supports sustainable living in Kenya. In March I spent a week just North of Mombasa looking at how things have progressed since my last visit over four years ago. The article gives an idea of how Haller started and some of the projects that are now happening on the ground. Look around at the lush and fertile landscape and it’s hard to believe that this is a man-made environment. Yellow weaver birds making a huge din whilst building their pendulous nests, a sleek cormorant prepares to dive into the water and even a hippo wallows in the mud. 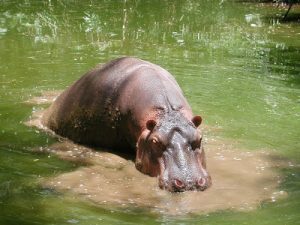 The hippo as it turns out has a vital role to play in the ecosystem. The mud on it’s back is removed from the ponds and so stops the water hole from silting up. The crocodiles too play their part. They feed on the dead farm animals or remnants from the thriving organic fish-farm. And their excreta helps fertilise the water making the algae grow, which is food for the fish as well as nutrients for the rice paddies and bananas. Only 30 years ago – this thriving forest landscape was a rocky, lunar-like desert, created by mining coral for cement. Actually, there are still parts of it which have been newly quarried to give one an idea of how it all started. The inspiration behind the transformation is Dr. Rene Haller, a Swiss agronomist, who has just celebrated his 50th anniversary of living on the Kenyan Coast. In 1959 he came to work at the Bamburi Cement Factory – growing fruit and vegetables for the workers. But Haller didn’t stop there. He started experimenting with different trees to see if any would put down roots into the dry, rocky terrain. The Casuarina tree, whose seeds had been washed onto Kenyan shores when Krakatoa erupted in the 1860s, was the best candidate. It produces nutrients in nodules on its roots and so is self-sustaining. But Haller’s most miraculous discovery was the beneficial effects of the millipede. This marvellous red-legged insect loves eating the needles dropped by the casuarinas. It’s pooh then becomes the humus for the more vegetation – thus starting the whole ecosystem development. Haller’s vision didn’t stop there. He managed to set up lots of different business enterprises supported by rehabilitated land, both employing and providing food for hundreds of local people. He also managed to demonstrate the value of conservation – for example, by showing farmers the benefits of tree-planting in preserving water for irrigation. An inspiring man, Haller has managed to get worldwide interest in his ideas. The most exciting of which is a charity named after him – Haller – which is promoting his ideas in the poverty-stricken rural communities close to the quarry. An example of the holistic thinking applied by Haller, the organisation, has been used in dam building projects. To prevent the fresh water pools becoming breeding grounds for mosquitoes, they have introduced fish, which eat the mosquito larvae. The fish are also a rich source of protein for the community and they fertilise the water, which makes it even better for feeding the crops. Also, any surplus fish can be sold, providing much needed income for the community. 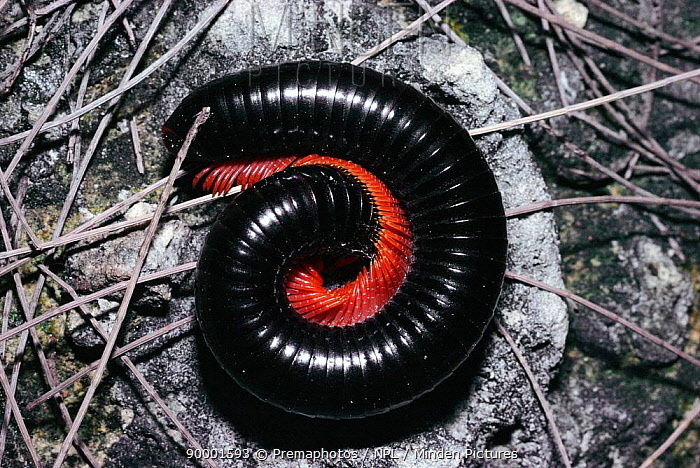 If you run through the forest trails, that now criss-cross the rehabilitated quarry land near Mombasa, you’re very likely to crush a shiny black millipede – or a mating pair – under foot. But you should avoid them if you can. They continue convert the forest floor into rich humus unaware of the pivotal role they’ve played in greening the cement quarry – and now helping the local people out of poverty. Rene Haller often says ‘seeing is believing’ – he doesn’t just tell people how to do something, he shows them. If you find yourself near Mombasa, go to Haller Park and have a look. If you’re not planning to be there you might be inspired by looking at the Haller website. This entry was posted in Charities & NGOs, Developing World, Done, News 2009, Projects and tagged Developing World, Haller, Kenya, Wildlife.